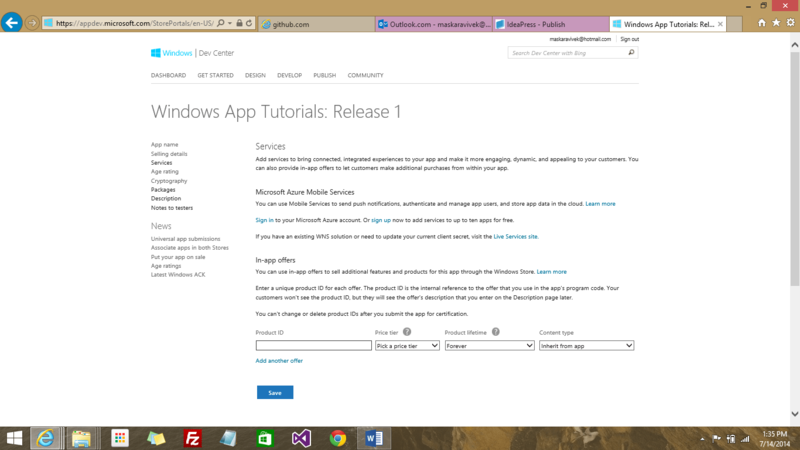 We have already seen that how you could make a windows phone app for your website using Microsoft’s app studio. Now let us try converting a wordpress blog to windows 8 metro app. There are plenty of templates available in app studio that let you create universal apps (for both windows phone and windows 8) but the website template doesn’t let you create a desktop app. So lets use another service which is more or less free if you follow this tutorial. Here’s a link to their website. They have a special section for Windows 8 app at http://win8.ideapress.me/. They have made the source code open to all and have put it up on github. One way is to download the zip file of the project and run it in visual studio to tweak things. This is more suitable for experienced developers. However, this blog post targets those who have just started with Windows development and want to see their wordpress website on a Windows 8 app without not much real coding. Follow these steps and at the end of it you will be ready with a published (or atleast submitted for certification) app. Go the link given below and click on Get Started to create a new project. Then go to Settings>> IdeaPress JSON API Settings and check whether both the listed controllers are active. By default IP_RESPOND is inactive. You need to activate both of them to make things work. It asks you for the Site URL in the first step. Enter the URL and move to the next step. It will then check whether the IdeaPress JSON API is installed on your website. If it isn’t installed or is inactive then you won’t be able to move to the next step. The wizard asks you for app name, description, category and default language in the General Info tab. Fill in all the details and move to the next step. This tab lists all the pages and post categories from your blog. Choose what you wish to display and what to omit. This is by far the longest step in the whole wizard. Choose the layout, theme and colors. Upload the logos, splash screen and live tile images. Move to next step when you are done customizing the look and feel of your app. The preview shows you exactly how your app looks. Step 8. Submit the app to the store. Go to windows 8 dev center and submit the app for certification. Here’s a blog post explaining how you could submit an app to Windows 8 dev center. That’s all you need to create a free Windows 8 metro app for your WordPress blog using IdeaPress. IdeaPress is a great way to convert your apps to Windows Phone 8 and Windows 8 apps.